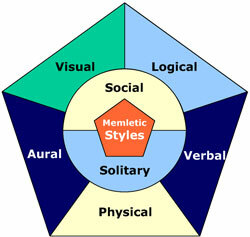 There’s a glitzier Flash-based Education Nation Learner Profile Assessment hosted by the University of Phoenix using the same seven categories as Memletics. The 21 questions are phrased differently (shorter than 70 by Memletics), and the research sources is not cited, so the validity of this assessment seems weaker. The primacy of verbal and aural over logical doesn’t feel right. In the Perceptual Modality Preference Survey on learningstyles.org, I sense information most as a print learner and a aural (listening) learner. I’m unlikely to learn by smelling or sniffing. The C.I.T.E. Learning Styles Instrument from the Center for Innovative Teaching Experiences at the Murdoch Teachers Center in Wichita, Kansas, based on (Babich, Burdine, Albright, and Randol, 1976) had better academic source (pre-Howard Gardner), but is available only administered on paper, and not electronically. A thesis by L. Harden (University of South Florida, 1992) says “use of the CITE learning style instrument … should be discontinued since no positive correlations were found with this instrument”. Along the way, I noticed a description of learning strategies (not styles) as serialist or holist, originating from Gordon Pask, described by James Atherton as (2011) at http://www.learningandteaching.info/learning/pask.htm . The controversy over learning styles as a topic is well described by Guy W. Wallace, “Why Is the Research on Learning Styles Still Being Dismissed by Some Learning Leaders and Practitioners?”, November 2011, ACM eLearn Magazine at http://elearnmag.acm.org/featured.cfm?aid=2070611.